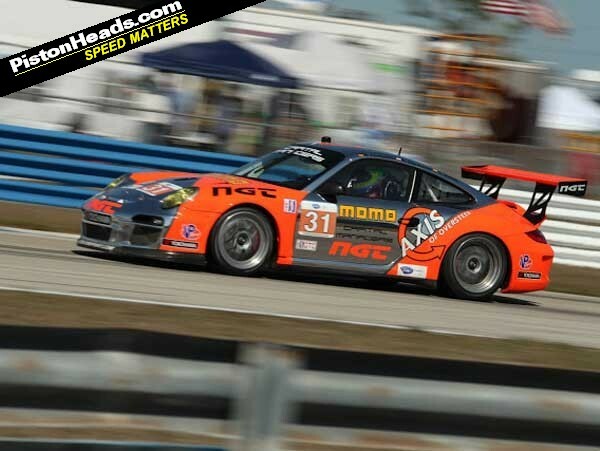 Away from the pomp and circumstance of F1 and its opening weekend fans of 'proper' racing may want to turn their attention to a bumpy old airfield in Florida and the opening race of the ALMS calendar - the Sebring 12-hour. Amid the merger of Grand-Am and ALMS into the new United SportsCar Racing championship this will be the last time LMP1 cars run at Sebring, making this traditional pre-Le Mans event a poignant occasion. Le Mans might be a few months off yet but Sebring has traditionally been considered a show of form for the big boys and, as such, it probably won't surprise you to hear that Audi has locked down the front of the grid with Autosport reporting Marcel Fassler in a 2012-spec R18 E-Tron pipping four-time winner Allan McNish in the 2013 car by nine thousandths of a second. Tight then! PH interest is, however, focused further back on the grid. Quite a bit further back in the GT Challenge class for 911 GT3 Cup cars and #31 car in the colours of our friends AxisOfOversteer, run by NGT Motorsport and driven by Carlos 'CG' Gomez, Kuba Giermaziak and Mario Farnbacher. We'll be hearing the inside line on the experiences of a privateer team in the midst of an international endurance race after the dust settles from the main event itself. 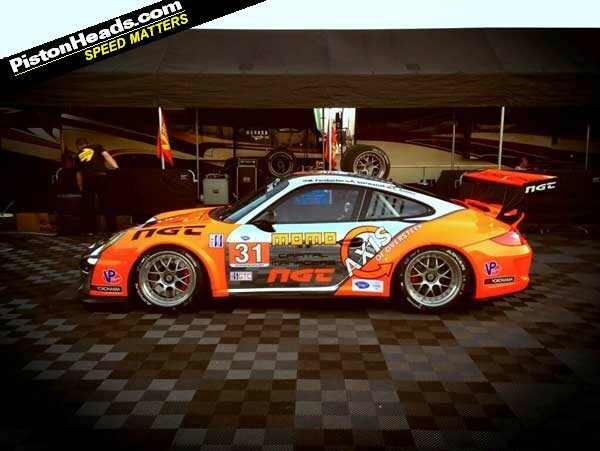 In the meantime you can read about the adventures of the Axis Porsche in qualifying here. And for the bigger picture and background to the team's entry check out the Team Axis feed. Good luck boys - see you on the other side! Qualifying was a trip, so many awesome drivers. I guess Porsche not supporting GT class and this being the final 12-hour under the ALMS flag really made this the deepest GTC field ever. Two drivers, Bleekemolen and Edwards, actually qualified with the same exact time down to the 1/1000th of a second. Pace on the Axis car is actually better than the P10 starting position would suggest, Kuba was within a 10th of Sean Edwards' time but Sebring is tricky and he ended up maybe overdriving on the lap when the tires were best. For the race though the pace is there. Stints will be about 60-65 minutes of green laps. Tires last about one and a half stints so the plan is to change them when gassing up. Single stints for the drivers since it takes 25 secs for a driver change and about 35 for fuel and tires. Start is Saturday at 1045h ET (four hours behind GMT so 1445h here). 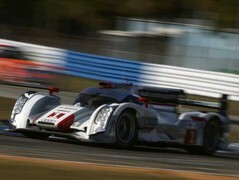 Race will stream live (for countries outside the US) on ALMS.com. You can cheer both, different classes! Team Corvette!!!! Take no prisoners! Really looking forward to this, as ever. Fingers crossed the ALMS stream is up to scratch! May not stay up until 3am or so for the finish though - bit of a lightweight these days. Yup, makes sky worthwile in my view, great the usa racing series, all of them although different flavours. That new Viper's pretty good! Yeah those wheels are lovely and deep. Looks great. I also love the Aston with the 2 lamps close together in the grill. 7 hours and some to go, we are sitting in P2 in class, chasing a VERY fast Jeroen Bleekemolen. 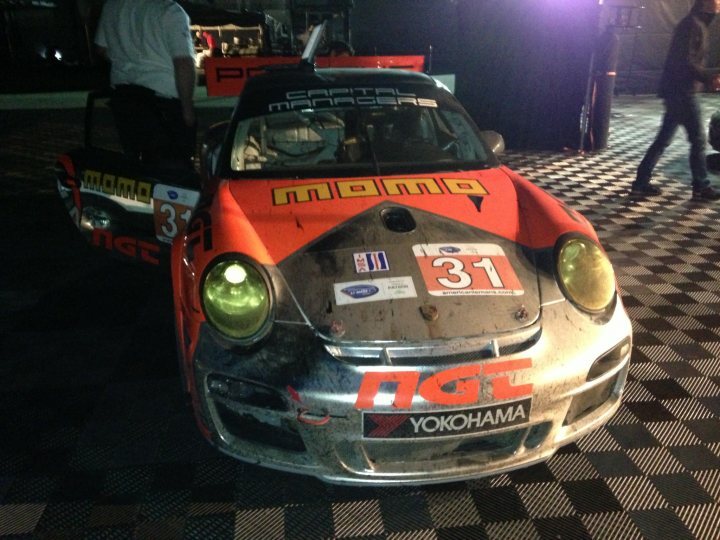 the #31 Axis GT3 after 12 hours of gas....err, petrol, sweat and tears!